It seems like my job never ends. I am awakened by little boys yelling, "Is it morning yet?" right around 6 am. After I answer, "Yes, you can get up now," I feed them breakfast, help them get dressed, rush three kids to the bus stop for school, referee fights and arguments, do dishes, do laundry, help pick up toys, feed them lunch, put the little one down for a nap, get after school snacks together, help with homework, cook dinner, argue with the teenager, calm down, eat dinner, do more dishes, get kids ready for bed, read stories, tuck kids in bed, finally go to bed myself at 11pm only to repeat this process again starting at 6 am the next morning. 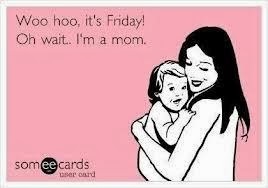 Motherhood is more than just a full time job, it is a full time job with extended overtime! Too bad I don't get paid. If I did I'd be a millionaire! This was a busy week at The Talbert Zoo. Monday night Goose had a choir concert. I went to it by myself and the kids did a pretty good job. The concert choir is really talented this year and I enjoyed the performances by the other three groups as well. Tuesday night Monkey had his last soccer practice. It's been getting darker up here right around 6pm, which is when soccer practice is. Soccer ended around 6:15 because it was too dark. I thought about getting some reflective tape for Monkey, but I really did not have time or money to go to the store for that. Maybe next year. We didn't do a whole lot on Wednesday. Chris was off in Portland and the kids were pretty well behaved that day. Yesterday I finally got my new lap top that I ordered over a week ago. It is an HP Pavilion TouchSmart with Windows 8. I'm still getting used to it but I can already tell that it is a lot faster than my old one. Hopefully, I'll get more done with this new computer. Last night Chris took Parrot to Cub Scouts after he returned from Portland. They painted each other's faces and played Twister. I heard that Parrot one the game of Twister. Today is finally Friday and I am looking forward to the weekend. This morning Chris checked on the kids' grades. Goose is still failing one class and has several missing assignments. We pulled her out of drama until she gets her grades up. Kitty isn't doing very well with reading and it is like pulling teeth to get her to sit down and read at night. She prefers to read books below her reading level or get read to. Her grades in reading are reflecting that. Parrot is testing in the 98th percentile this year. Last year his test scores were in the 99th percentile. But it appears that there is one kid in the first grade that has higher test scores than he does. When I told him that he is still doing well, although his test scores are not as high as they were last year he asked me what he could do to get smarter. I told him he needs to read more and challenge himself in math at home. He is also planning on playing more educational computer games to help him do better in school. Parrot is very competitive when it comes to school work. He is determined to be the smartest first grader at Snowdon Elementary. Last year he was the smartest Kindergartener at Windsor. Tonight Chris and I are going to have date night. Tomorrow Monkey has his final soccer game and on Sunday we are going to carve pumpkins. What are your plans for this weekend?